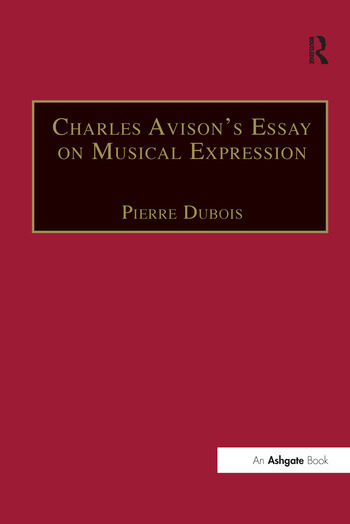 Charles Avison's Essay on Musical Expression, first published in 1752, is a major contribution to the debate on musical aesthetics which developed in the course of the 18th century. Considered by Charles Burney as the first essay devoted to 'musical criticism' proper, it established the primary importance of 'expression' and reconsidered the relative importance of harmony and melody. Immediately after its publication it was followed by William Hayes's Remarks (1753), to which Avison himself retorted in his Reply. Taken together these three texts offer a fascinating insight into the debate that raged in the 18th century between the promoters of the so-called 'ancient music' (such as Hayes) and the more 'modern' musicians. Beyond matters of taste, what was at stake in Avison's theoretical contribution was the assertion that the individual's response to music ultimately mattered more than the dry rules established by professional musicians. Avison also wrote several prefaces to the published editions of his own musical compositions. This volume reprints these prefaces and advertisements together with his Essay to provide an interesting view of eighteenth-century conceptions of composition and performance, and a complete survey of Avison's theory of music. Contents: Introduction; Charles Avison, An Essay on Musical Expression (1752-53); William Hayes, Remarks on Mr. Avison's Essay on Musical Expression (1753); Charles Avison, A Reply to the Author of Remarks on the Essay on Musical Expression (1753); Charles Avison, Miscellaneous 'Prefaces' and 'Advertisements': 'Preface' - 6 Concertos in 7 Parts op. 3 (1751); 'Advertisement' - 8 Concertos in 7 Parts op. 4 (1755); 'Advertisement' - 6 Sonatas for the harpsichord op. 5 (1756); 'Advertisement' - 26 Concertos (1758); 'Advertisement' - 6 Sonatas for the harpsichord op. 7 (1760); 'Advertisement' - 6 Sonatas for the harpsichord op. 8 (1764); 'Preface' - 12 Concertos op. 9 (1766); Charles Avison, 'Remarks on the Psalms of Marcello' (1757); Appendices; Bibliography; Index.